So while admiring my new Jugrnaut "Duck Down" Fitted and peeping their blog I came across a video posted by Mr. Rogers for this artist named "Outasight." He's not quite "mainstream" yet but he did win MTVU’s “The Freshman” contest for his track “Good Evening” so he may not be underground for long, so I figured I should give him some shine on here before he gets bigger. He has an album dropping this summer called “From Here To Eternity” which this "mixtape" is an album prequel for (Download and links after the video below.) It is presented by Mick Boogie and PressPlayShow.com. 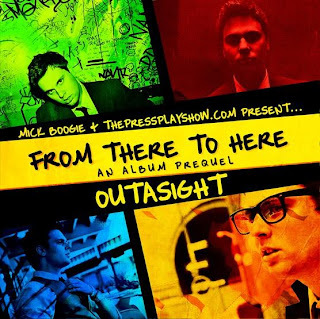 You may see the black thick rimmed glasses, suit & tie and compare Outasight to Mayer Hawthorne, another white artist with a soulful voice, but the similarities are mostly aesthetic. For one I prefer Outasight's blues-tinged tone over Mayer's cleaner, higher pitched crone. And for some reason Mayer Hawthorne has started to grate me lately, he was dope enough when I first heard him but I honestly got tired of his voice real quick. Outasight isn't necessarily the greatest new soul voice ever either, but he couples his formidable singing with some pretty dope rapping as well. Not a huge fan of the singer/MC combo deals but he pulls it off well, similar in skill (not style) to Phonte of the late Little Brother. I could listen to an entire album of him either just singing or rapping which should be the only reason to do both on your songs. If you're mediocre in either department you shouldn't do both, too many rappers nowadays are singing/playing instruments etc just because they have some level of competent skill. Just cuz you took a few guitar lessons or found auto-tune doesn't mean you should start playing while you sing/rap (I'm sure you can figure out who I'm referring to here.) Enough of my tangents though, definitely check this guy out. He's worth your time.